I am happy to assist you in a number of additional services as well as the vacation planning and activities. If you need a special service, please feel free to ask. If I don’t handle it myself, I am sure to know someone to assist you in your needs. Imagine having a private chef to prepare you dinner either in your condo or on the beach. This is great way to celebrate a honeymoon, anniversary or just a romantic evening. Photography Service. Sometimes you just have to pay to have a professional. However, sometimes you just want a few casual shots on your own camera. I am often available to come and take a family photo or the vow renewal shots. 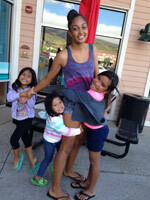 Babysitting Services are available here in Maui. We are happy to refer you to a service that is licensed, bonded and has excellent referrals. Getting Married or would like to renew your vows? I refer my clients to Lorrie Betsill-Nielsen of Maui’s Angels Weddings. I have known Lorrie for many years and she has a wonderful team who can assist you in planning your special wedding day or vow renewal. Please let them know that Kay referred you. 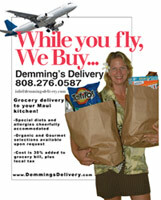 Grocery Delivery Service is available. You can have groceries delivered to your condo before you arrive. You can have Demming full shop for you or she has smaller packages with Breakfast items to get you started your first morning. She also has picnic baskets, gift baskets and flower arrangements. Be sure to tell Demming that Kay referred you. Smartphone or Laptop Service. Things happen while on vacation too. 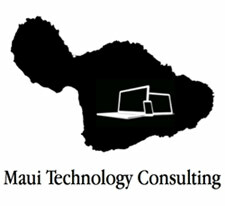 If you need assistance with your smartphone or laptop, I highly recommend Christopher Brown with Maui Technology Consulting. Mostly servicing West Maui, he is honest and reliable, and handles all my IT needs.